Could your dog be a life saver? As one of the nurses working at Milton Keynes Veterinary Groups main hospital, I am excited to be working with Pet Blood Bank UK to register the hospital and hold dog blood donor sessions. Pet Blood Bank UK is a non-profitable charity which provides a national canine blood bank. Just like people, sick dogs sometimes require blood transfusions, with one single donation saving the lives of up to four dogs. 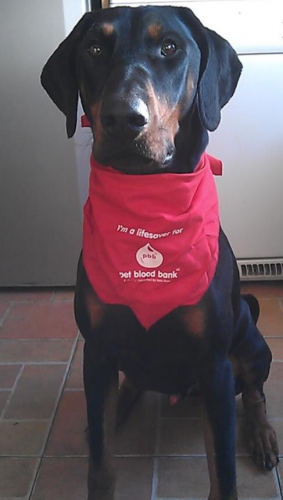 My own dog, Westwood (pictured above) was a donor for Pet Blood Bank UK and donated several times. Unfortunately, as he is now receiving immunotherapy injections, he is no longer able to donate. In order to hold sessions at the practice, we must provide Pet Blood Bank UK with a list of 50 possible dog donors. Pet Blood Bank UK will then contact owners directly to arrange appointments. Dogs can donate up to four times a year. The comfort and health of our donors is very important to us and Pet Blood Bank UK. All dogs will be weighed and undergo a physical examination by a Pet Blood Bank UK veterinary surgeon each time they donate. Dogs will also be microchipped if they are not already. A small blood sample is obtained to check your pet is healthy, determine their blood type, and to ensure they are not showing any signs of dehydration or anaemia before their donation. If all is well then 450mls blood is collected. Dogs are gently restrained on their side, and blood is taken from the jugular vein in the neck. The actual donation only takes 5-10 minutes, although you should allow around 40 minutes in total for your appointment. A light dressing will be applied to your dogs neck after donation and their pulse is checked. Dogs are then given lots of praise and cuddles, followed by a well-deserved drink and bowl of food, and a doggie bag of treats to take home. You will be asked to sit with your dog for a short period of time prior to them having a final check before they are sent home to take it easy for the rest of the day. For more information, or if you are interested in registering your pet becoming a blood donor, please contact the surgery on 01908 397777 and ask to speak to Jess.